As far as iPhone games go, you are unlikely to come across one that is more addicting than Doodle Jump iPhone Game Application. It is a deceptively simple game that is well worth the price of download. The iPhone game app itself appears to have been inspired by a game called PapiJump, made by Sunflat. 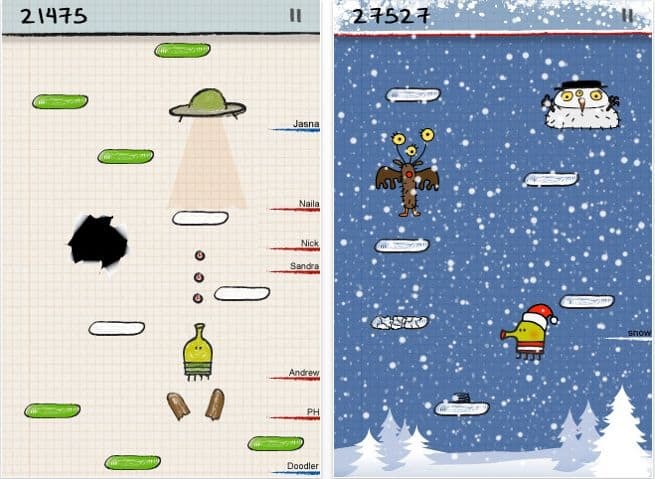 However, the improvements Lima Sky made to the game concept make Doodle Jump far superior, and more fun. The basic idea behind the Doodle Jump game for iPhone or iPod Touch is that you are a doodle on a piece of graph paper, trying to jump your way to the top. You do that by jumping on the green platforms, which spring you up. Some extras that can help you along the way are a propeller hat, a jet pack, and springs on some of the platforms. You move left and right by tilting the iPhone, and tap the screen to shoot. What would you be shooting at? Well, the game also includes a variety of obstacles from broken, moving and disappearing platforms to monsters, UFOs and black holes. You can avoid these obstacles, shoot them, or, at least for the monsters, jump on them. As addictive as this game is, it is made even more so by the in-game high score reporting, where you can see lines on the right side with names, indicating global players you are passing. That turns the game into a race to be the king of the graph paper hill. You can get this game yourself for only $0.99 from the iTunes Store. Just go to the iTunes App Store Now.